Here’s a (hopefully) complete list of entries in the Open 7400 Competition. Please share your favorites in the comments below, your favorites will receive a special reader’s choice prize. Voting ends in 24 hours. A few commentators will receive free PCB codes as a thank you for voting. A huge thanks to everyone who voted. Judges are deliberating now, final results will be posted by November 10th. This entry was posted on Wednesday, November 7th, 2012 at 1:00 am	and is filed under 7400 contest, contest. You can follow any responses to this entry through the RSS 2.0 feed. You can skip to the end and leave a response. Pinging is currently not allowed. My favorites (assuming I can’t vote for mine) are the constant load with nixie readouts, and the Class D amplifier using digital logic. However, I would have to throw a vote to the 4049 Inductance meter because it is a useful thing made out of really old tech that I now want to build! The list can’t be this small, I wanted to vote for my friend who entered 2 projects, can I vote for projects not on the list. As I can’t see his projects here…..
I’d have to say the constant load with nixie readouts. It’s useful and the nixies are a nice touch. It shows how the basic unit of a FPGA works. My favourite is Build your own FPGA. I think Nick should try 3D topology next! Also, 4007 opamp is pretty awesome. I was thinking about doing it too! My vote is for the The BrainF**k machine. Although the guy didnt actually built it, I found he made a very clever set of design choices. The build-your-own FPGA was very instructive for me. The passive RFID tag has to take the cake, I want to build one! I’m torn between the sheer ingenuity of the Build Your Own FPGA and the Retro feel of the DIY keyboard. and the second to the definitely cool “Data encryption and decryption system using 74xx logic gates”. “Passive RFID Tag” is definitely the coolest one. Obviously I am going to vote for my project “7400 Based Digital Calculator”, but I can also see some interesting project out there. In the absence of a vote for my own Discrete FPGA project, I’ll vote for the 1-bit processor, for introducing me to the concept of bit-serial CPUs. Passive RFID tag, definitely. Especially because it has such a slick end product. Since I am more of an analog person, I was impressed by the the extreme measures of the Class D amplifier using digital logic (hasn0life) using buffers in parallel to get the necessary amount of output current. I was blown away, however, with the “build your own FPGA”. Me vote goes of to Bertho with his Passive RF74xxID tag. My vote is for 7400 LOGIC BASED CALCULATOR . ‘Build your own FPGA’ is really impressive. Complex work in both HW and SW. 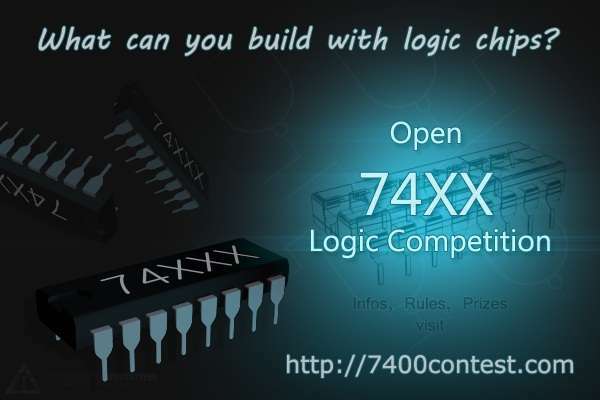 I vote for 7400 LOGIC BASED CALCULATOR …..
My vote goes to ‘Build your own FPGA’ project…very cool project….help understand the fundamentals of FPGAs and how they work…. My vote has to go to the the DFPGA (“Build your own FPGA”), for not only an interesting project but also a fantastic writeup. I will also vote for the “Build your own FPGA”. It’s a really awesome project and might be very useful for educational purposes. I vote for 7400 Logic based Calculator. I give my vote to the homebrew FPGA. Very nice design and gorgeous CMS build, well done ! Im a great fan of the Passive RFID Tag, I love the mashup between old school logic and fancy modern RFID. As a bonus the documentation is excellent and the end product is beautiful. My vote is for the Constant load with nixie readouts. I think it was the nixies that did it for me and the fact that I need an other piece of equipment on the bench. I vote for the polonaise machine! It’s full of win and awesome. My vote goes to the DFPGA. Great project and very good write up of it too. I found the discrete FPGA very instructive. CD4000 digital alarm clock gets my vote! My vote goes to 7400 Logic based calculator. I like mine of course, the CMOS Frequency Counter :) But I take my hat off to the Passive RF Tag’s creator who has done a tremendous good job in his circuit, I really like it! Nice design and idea! I’ll cast my vote for the RF74xxID! My vote goes to CMOS Frequency Counter. My vote is 7400 logic based calculator…..!~! The passive RFID tag! It is by far the most ambitious project this year. 7400 logic based calculator seems interesting and practical. My vote is for “7400 based calculator”. these guys are genius ! My vote is for “7400 based calculator”. My personal favorite though is the BrainF*ck Machine, I really like unusual computer architectures, and I think it’s great to have a “functional” computer using 20 readily available logic chips. Of course, the other entries are also pretty amazing…. My first place vote is for the DIY 6502 computer. For second place I vote for 7400 Logic Based Calculator. There are a lot of great entries! I’m really impressed with the RFID tag. To even think of doing this is amazing!!! My vote goes to Data encryption and decryption system using 74xx logic gates. I vote for DATA encryption and Decryption …Really a great work… seems to be unique. i vote for Data Encryption and Decryption System using 74xx logic chip. “Data encryption and decryption system using 74xx logic gates” is the clear winner here .. My votes for that brilliant idea ! “Data encryption and decryption system using 74xx logic gates” .. My votes for the best one ! Am I the only one who thinks there’s something hinky with the voting for a couple of the projects? i liked most of the projects, my favorites were the q*bert, fpga, keyboard, and all the game projects. I hope this doesn’t scare off future contest participants from entering because they can’t (or don’t want to) get a group of people to vote for them. I also hope this doesn’t become a trend. Maybe there should be some kind of qualifications to vote? Also, were there judges this year? We figured it was ok because anyone was welcome to recruit friends and family to vote. We did not however count the vast majority of votes that were put in the wrong place (eg on the entry instead of here). There were 6 judges from the community this year, but we also included reader feedback in the ranking system and grand prize winner. I would have preferred that only proper registered forum members could have voted out of fairness reasons. I’d say that the winner of the grand prize is on the very thin line between just following the rules set by DP and cheating. It would have been all to easy to make a small script that via TOR would have voted 4000 times with different names and ip addresses on my entry. But since all of this is “just for fun” I really don’t care too much. I just hope that the winner make good use of his selected prize….. I think it would have been fairer if only other competitors could vote for the reader’s. It’s easy to register on the forum just to vote, so I think enforcing forum register is not strong enough. Also It’s a bit sad that the most important voting category this year was indeed a popularity contest, with not to do with the criteria stated at the begin of the contest. I’m sorry you were disappointed by the approach. I’ll definitely consider your suggestions if we every do something like this again. – I don’t think Reader’s Choice was a bad idea, but when there’s few enough votes that a small group of legitimate voters (eg, a uni class) are enough to swing the vote, it’s going to be very prone to bias – less about the project, and more about who made it. That’s always going to be the case, but it’s more noticeable when the number of votes is small. – I think the choice of the grand prize should have been left up to judges, not readers. – I really would have liked to see more stratification in the prize levels. I realise one of the motivations was probably not to string out the process of giving out prizes too much, but I honestly think 15 first place winners is too many. It would have been much preferable if the judges had divided into categories with much more granularity. – A short blurb from each judge about what they liked about this year’s entries, which entries particularly impressed them, what they thought was particularly novel, and so forth, would have been awesome. All that said, thank you for running an awesome and inspirational contest. I’ve learned a lot both from building my own entry and reading about others’, so what more could I really ask for? It is great to see student entries IMO especially from outside Europe and the USA – hearty congratulations to the winners! In future I think it would be nice to have a separate student prize category mainly to stimulate entries from students but perhaps it might also help sidestep some of the classroom voting issues. Thanks also to the anonymous judges on the forum. Voting have already been ended. It would have no worth I think. I vote for circuit based on Cryptography. Data encryption and decryption system using 74xx logic gates is the best among all these projects.I would definitely vote for it. ‘Data Encryption and Decryption’ using 74xx logic gates would be a good one. I vote for it…. I vote for Data encryption and decryption system using 74xx logic gates.